Posted By: DEEP NNN <deep_nnn@hotmail.com> Date: 2/2/12 3:56 p.m.
Everyone who goes into REACH Match Making (MM) is greeted with information showing the number of players online and the number of players in their selected Playlist. These numbers by themselves tells a story within which one can compare the current popularity of a playlist. Each playlist population pool represents a simple percentage of the total MM population. I shall refer to this percentage as popularity. Current popularity is only part of the story and Playlist Managers must also take into consideration other factors when making decisions affecting the playlists. One of those factors is the popularity trend of a playlist. Which playlists are losing population and which ones are gaining? I collected for almost two months the population figures provided by the Halo REACH GUI, be they accurate or not, which I shall now present. All values were collected at or very close to 7:00 PM Eastern Time. 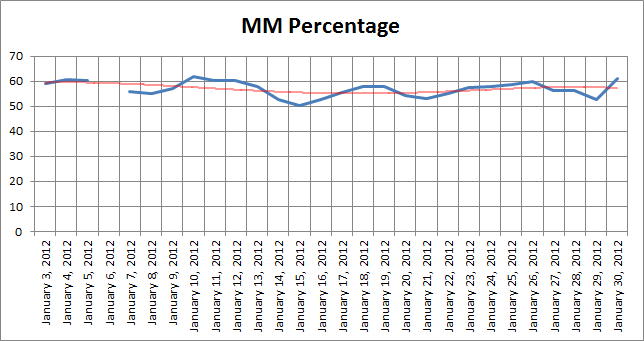 This time is also very close to Peak MM activity. When I first began this study I was not collecting data for every playlist. Then it occurred to me that by collecting all of the playlist I would gain a MM total. I would then be able to show playlist popularity as a percentage of MM Total which is much more meaningful than a simple player total. Eventually I also started collecting the Players online in REACH. That again provided a meaningful percentage showing how much of the REACH population is in MM and how much is doing something else like Campaign, Customs, Theatre, Forge and Idling. I can't continue without recognizing that Playlist Managers must have a huge arsenal of statistical data to support their decisions. Population totals, population percentages and population trending are a big part of the story but to make changes based on that alone is tantamount to using a Ouija Board. Outcomes could be dramatic and not necessarily what was desired. I offer a small list of influences which must also be considered. Skill, fun, social diversity, time zones, cultural differences, gender, new, returning or abandoning REACH just to name a few. I.E. A playlist gains or loses substantial population. Good information to know would be what playlists were also affected and were players gained from or lost to other IP titles. 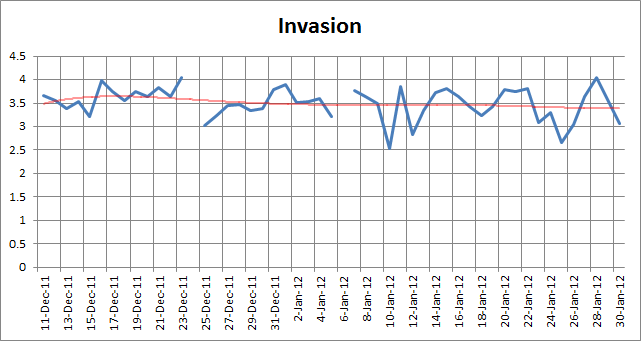 Most of the charts include a red Medianline/polynomial/order=5 for referencing trends. Please use this as a guide only. I really don't know how to properly use them. Also, the first and last few days may show a wonky trend because of a lack of data outside the study period. For reference, I offer the following chart of UU/24hr for the study period. Total MM population. The population made steady gains until the middle of the study where it became mostly stable with a normal weekly rhythm and a hint of an upward trend at the end. It strongly matches the Unique User/24hr results I published in my December and January population reports. 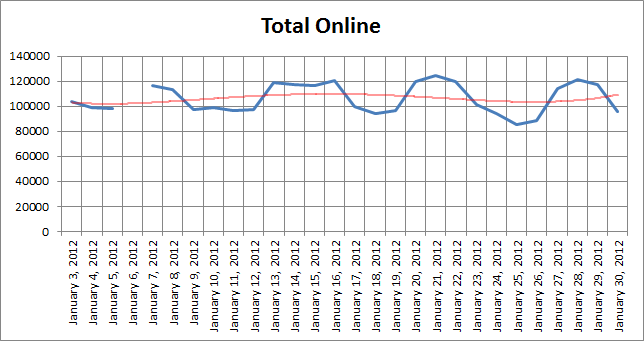 Total Online population didn't get collected until January 3 2012. It also shows results similar to Total MM and my UU/24hr population reports. Total MM as a percentage of the Total Online population. As you can see, anywhere from ~50% to 60% is in the MM playlist pools and has a fairly steady rhythm. I find this quite amazing in that is also means ~40% to 50% are doing something else. There is no way for me to know what they are actually doing. Possibilities include, idling, Campaign, Forge, Customs, Theatre. A comparison of MM versus non-MM could become important to a playlist manager if the population is moving away from MM to more personal activities. 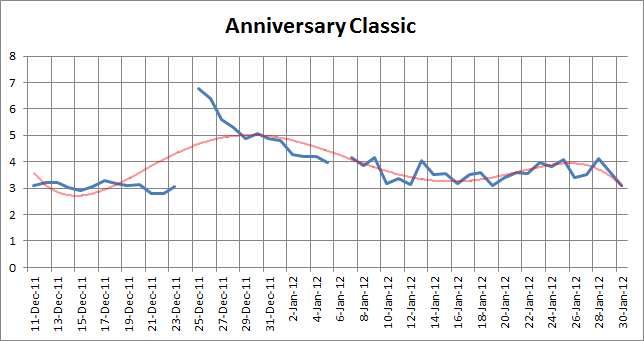 Anniversary Classic is a healthy TU playlist that was very steady in December until the holidays when it spiked. No doubt many Halo CE Anniversary gifts were given during that time period. After the holidays it immediately and steadily started losing popularity. This is no surprise for any new game. I say new in terms of many of these new players do not own any other version of REACH or REACH multi-player maps. The last few weeks of the study showed its popularity trend as being fairly steady with a small rise with minimal fluctuations and what might be a downward trend in the last week. 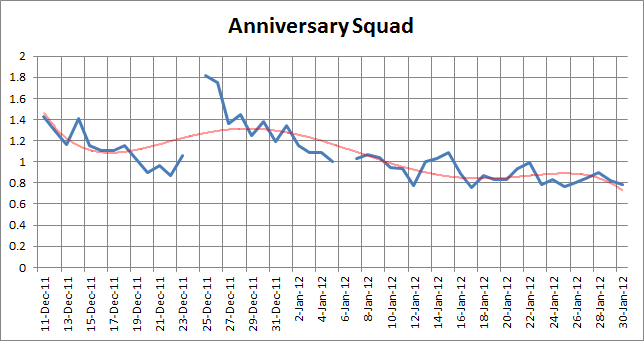 Anniversary Squad is a TU playlist whose popularity was trending downwards in December until the holidays when it spiked. No doubt many Halo CE Anniversary gifts were given during that time period. After the holidays it immediately and steadily started losing popularity. This is no surprise for any new game. I say new in terms of many of these new players do not own any other version of REACH or REACH multi-player maps. The last few weeks of the study showed its popularity trend as being fairly steady but trending slightly downwards with minimal fluctuations but lower than it started in December. The seasonal gifting effects were completely wiped out plus additional losses. 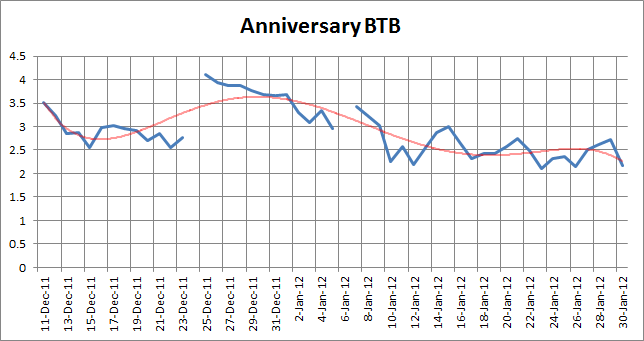 Anniversary BTB is a TU playlist whose popularity was trending downwards in December until the holidays when it spiked. No doubt many Halo CE Anniversary gifts were given during that time period. After the holidays it immediately and steadily started losing popularity. This is no surprise for any new game. I say new in terms of many of these new players do not own any other version of REACH or REACH multi-player maps. The last few weeks of the study showed its popularity trend as being fairly steady but with a hint of trending slightly downwards with minimal fluctuations but lower than it started in December. The seasonal gifting effects were completely wiped out plus additional losses. Anniversary FFA is a TU playlist whose popularity was somewhat steady in December until the holidays when it spiked. No doubt many Halo CE Anniversary gifts were given during that time period. After the holidays it immediately and steadily started losing popularity. This is no surprise for any new game. I say new in terms of many of these new players do not own any other version of REACH or REACH multi-player maps. The last few weeks of the study showed its popularity trend as being fairly steady but trending slightly downwards with minimal fluctuations but lower than it started in December. The seasonal gifting effects were completely wiped out plus additional losses. 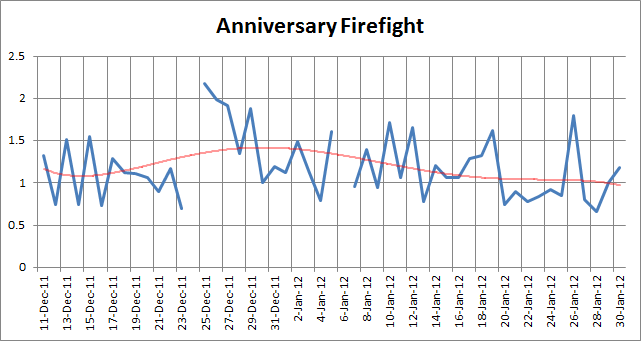 Anniversary Firefight is a non-TU playlist whose popularity was somewhat fluctuating with a small downward trend in December until the holidays when it spiked. No doubt many Halo CE Anniversary gifts were given during that time period. After the holidays it immediately and steadily started losing popularity. This is no surprise for any new game. I say new in terms of many of these new players do not own any other version of REACH or REACH multi-player maps. The last few weeks of the study showed its popularity trend as fluctuating but trending slightly downwards but similar to what started in December. The seasonal gifting effects were almost completely wiped out. Firefight playlists are heavily influenced by daily credit earning Challenges and so trends musts be measured over longer periods of time. 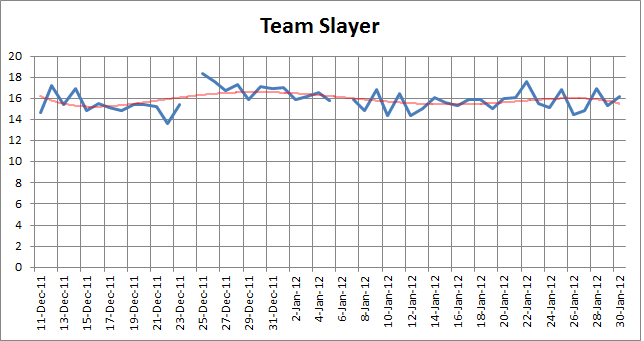 Team Slayer is a non-TU playlist which was fairly steady with a small downward trend in December until the holidays when it spiked. After the holidays it slowly lost popularity for a few weeks and then slowly rebounded. The last few weeks of the study showed its popularity trend as being fairly steady with regular fluctuations. From this study I have concluded that the TU has neither attracted nor dissuaded any significant population change for this playlist. That's not to say it isn't possible just as many people fled to TU playlists as have been gained from them. 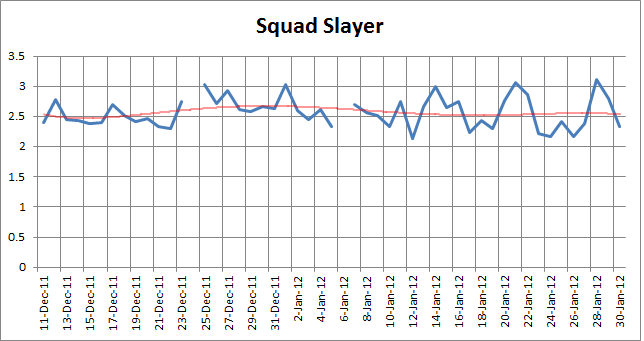 Squad Slayer is a healthy TU playlist whose popularity was fairly steady in December until the holidays when it spiked a little. After the holidays its popularity lowered a bit. The last few weeks of the study showed its popularity trend as being fairly steady with regular fluctuations which may average what it had in early December. From this study I have concluded that the TU has neither attracted nor dissuaded any significant population change for this playlist. That's not to say it isn't possible just as many people fled to vanilla playlists as have been gained from them. This playlist's fluctuations suggest credit challenge influences. 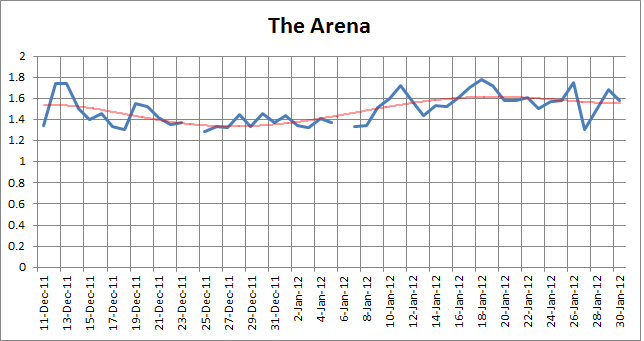 The Arena is a somewhat healthy playlist that started out the study period as non-TU then switched to TU on January 10. It lost popularity from early December and then was fairly steady even through the holidays. After the January playlist update its popularity trended upwards. 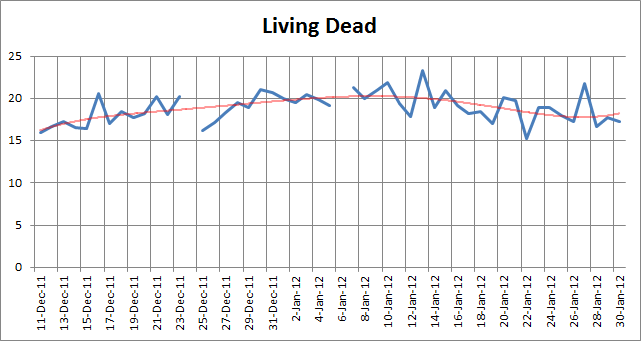 The last few weeks of the study showed its popularity trend as fluctuating and may now be trending downwards. Difficult to tell at the moment. From this study I have concluded that the addition of TU has positively affected its popularity. No way of really knowing for sure. 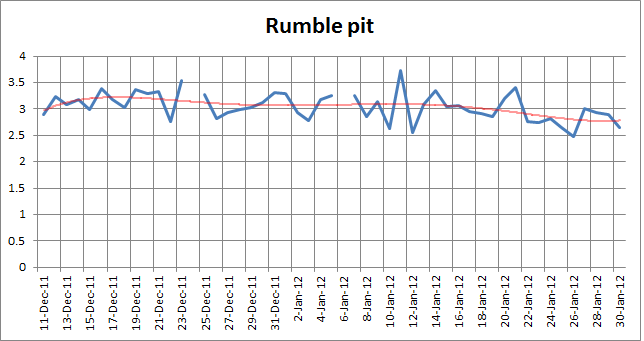 Rumble pit is a healthy non-TU playlist and was fluctuating around the same average popularity from December until January 15 but has been trending downwards for the last two weeks. 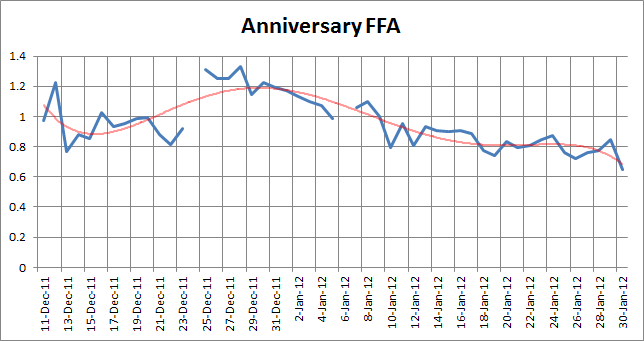 This is notable because Anniversary FFA has also been trending downwards. Looks like FFA gametypes, be they TU or vanilla, are less popular at the moment. Where are these people going? Living Dead is a non-TU playlist whose extremely high popularity I find very perplexing. I do not feel that it exudes an aura that says Halo to me. For a gametype that was once popular only in customs, it is ridiculously popular in REACH MM. Its popularity back in late March 2011 was 5.8% and it rose from that to 15.9% at the beginning of this study and then again to 23.2% by January 13. It has been trending downwards since then. It's important to note the January 10, 2012 Matchmaking Playlist Update included some new map variants. Some of these maps include changes that should have reduced player exploits. Sounds like there is a story here. 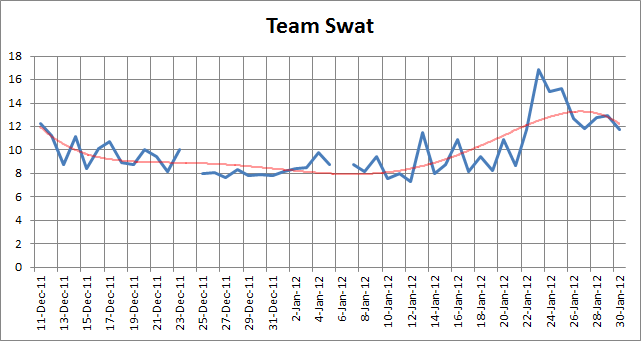 Team Swat is a very popular non-TU playlist which started off the study period with a slight downward trend ending around December 31. 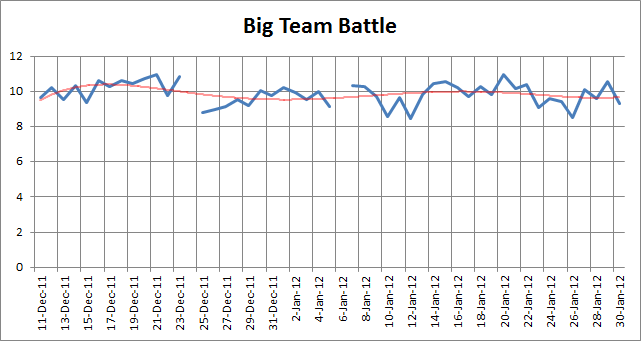 Then it regained much of the popularity it lost followed by a multi-day peak around January 23. Since that peak, the popularity is trending down to what it was at the beginning. Was this the result of a weekly challenge? Please have a look for me. You didn't think I was going to do all of the work for you, did you? 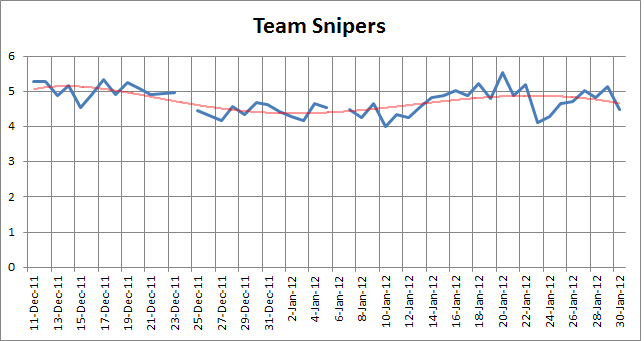 Team Snipers is a healthy non-TU playlist whose popularity changes are not too notable. 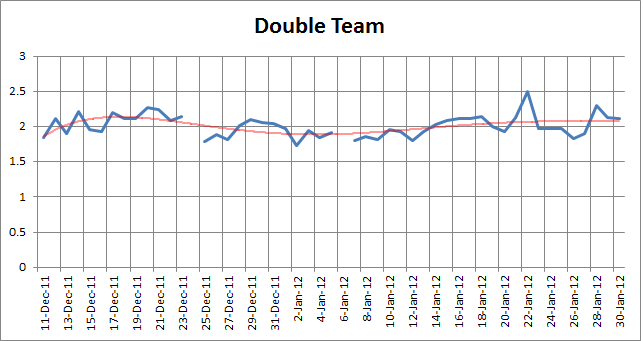 There was a small steady decline to the middle of the study period and it has mostly recovered. 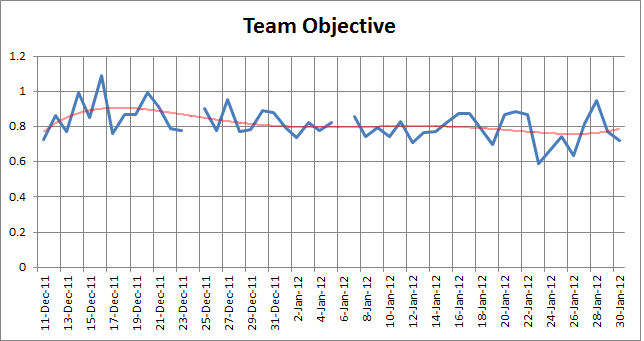 Team Objective is a relatively unpopular TU playlist. Its popularity trend was fairly unremarkable but it does appear to be slightly lower than at the beginning of the study period. It is marked by fluctuations which might be attributable to credit challenges. Double Team is a healthy playlist. It started the study period out as non-TU and was changed to TU on January 10. Its popularity trend was fairly unremarkable but it does appear to be slightly higher than at the beginning of the study period. From this study I cannot conclude the TU alone had any significant effect on this playlist. I concede that it might have. Multi Team is a healthy TU playlist. Its popularity trend was fairly unremarkable but it does appear to be slightly higher than at the beginning of the study period. This playlist also appears to be heavily affected by weekends and or credit challenges. Invasion is a healthy non-TU playlist. Its popularity trend was fairly unremarkable but it does appear to be slightly lower than at the beginning of the study period. This playlist also appears to be heavily and negatively affected by challenges. It has deep valleys as opposed to steep spikes. Big Team Battle is a very healthy playlist that started out the study period as non-TU then switched to TU on January 10. Its popularity trend was fairly unremarkable but it does appear to be slightly lower than at the beginning of the study period. This playlist also appears to be heavily affected by weekends and or challenges. From this study I have concluded that the TU has not heavily affected its popularity but it appears to have had more valleys than peaks. 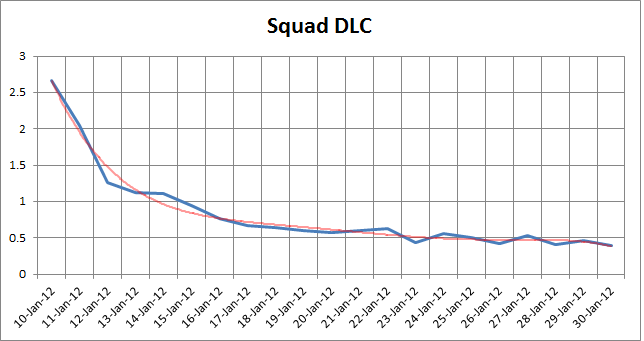 Squad DLC is a non-TU playlist that started out on January 10, in the middle of the study period, healthy but dramatically lost its popularity and is continuing to lose it. I suspect before I publish this report 343i will announced its removal from MM. With two other competing Squad playlists and issues complicating map selection it is no surprise it has essentially died. From this study I have concluded that the TU has not negatively affected its popularity from the point of view that the other Squad playlists did not appear to have benefitted from this playlist's losses. 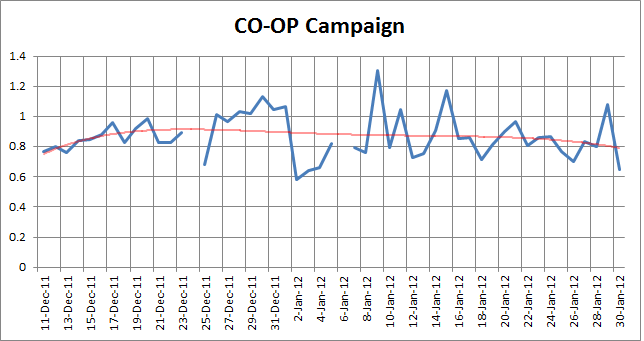 CO-OP Campaign is a relatively unpopular non-TU playlist that is one of the core features of REACH. It saw popularity gains going into the holidays and losses since. It finished the study period about where it started. It appears to be heavily affected by credit challenges. 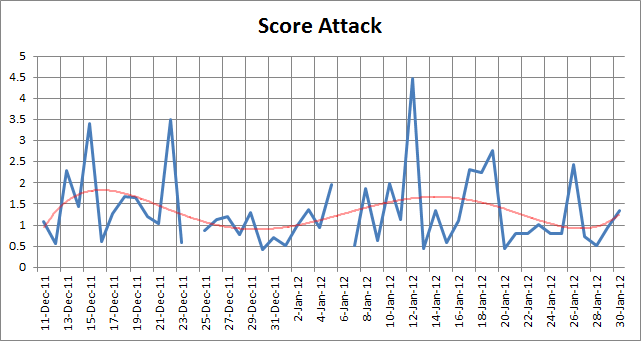 Score Attack is a sort of popular non-TU playlist that is one of the core Firefight features of REACH. It is dramatically affected by credit challenges. So much so, it must negatively affect other playlists for short periods of time. 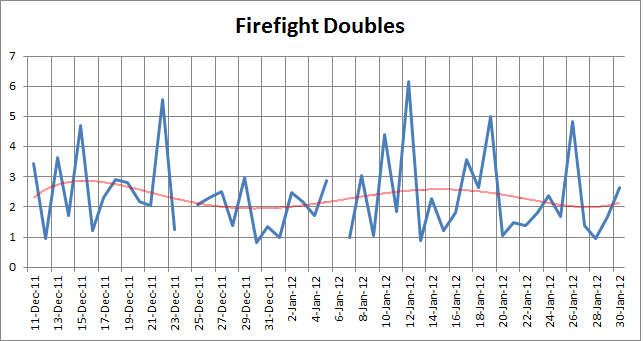 Firefight Doubles is a healthy non-TU playlist that is one of the core Firefight features of REACH. It is dramatically affected by credit challenges. So much so, it must negatively affect other playlists for short periods of time. 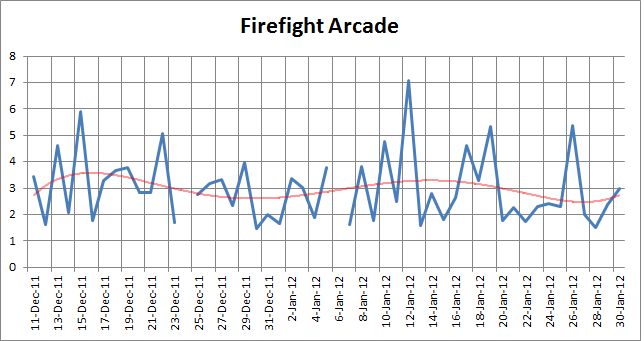 Firefight Arcade is a healthy non-TU playlist that is one of the core Firefight features of REACH. It is dramatically affected by credit challenges. So much so, it must negatively affect other playlists for short periods of time. 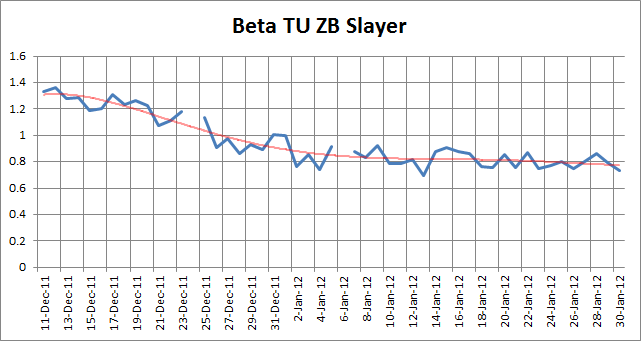 Beta TU ZB Slayer is a TU playlist featuring Zero Bloom on some weapons. It has trended steadily down from the beginning of the study period to about the middle and now appears quite stable. The addition of the TU being pushed into more playlists at the beginning of the study may have caused the early decline but not the additions on January 10. The playlist is supposed to be a test bed for TU gametype changes but none have yet occurred. I believe this playlist doesn't really serve a purpose and probably should be removed or replaced. I figure this minimal population will move into the other TU playlists as a consequence. Is that the wind I hear howling? Die ZB bastards die! MLG is a somewhat healthy TU Zero Bloom playlist. It lost popularity steadily until the middle of the study period and rebounded slightly. I attribute the early popularity to the addition of ZB but also to a rallying cry from MLG community leaders who to this very day are trying to renew interest in REACH MLG gametypes and Halo at MLG events. 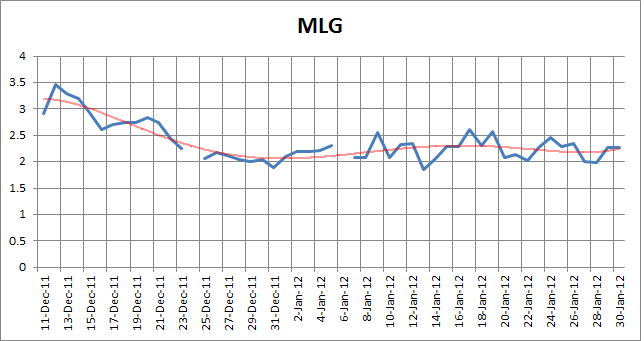 I say this because on December, 4 2011 around 9:00 Eastern MLG only had 344 players. 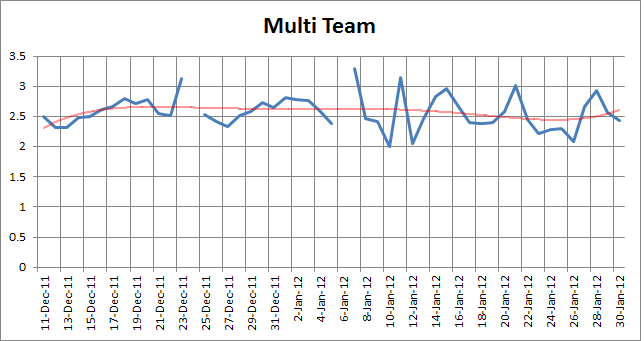 As of this writing Halo REACH may not even be on the MLG circuit for 2012. If that should come to pass, should 343i seriously think about removing the MLG playlist. After all, MLG is a niche gametype that only supports interest in a sport that must exist to be credible and we would have no idea what that sport will look like after Halo 4 is released. Discuss (runs away). Action Sack is a non-TU playlist that includes many of the specialty gametypes which Bungie provided. Its popularity trend is somewhat steady but the population is heavily affected by credit challenges, in my opinion. 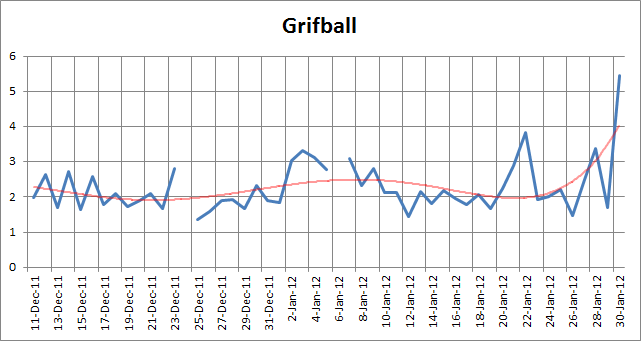 Grifball is a healthy non-TU specialty playlist with a significant upward trend at the end of the study period. This playlist appears to be affected by credit challenges but I also think scheduled league activity may also have an effect. I don't know too much about the league activity. I play Grifball only when forced to by friends. REACH MM Playlist Popularity Study DEEP NNN 2/2/12 3:56 p.m.
Re: REACH MM Playlist Popularity Study Lawnmower172 2/2/12 4:26 p.m. I play Grifball only when forced to by friends. JDQuackers 2/2/12 4:40 p.m.
Re: I play Grifball only when forced to by friends Revenant1988 2/2/12 5:02 p.m.
Re: I play Grifball only when forced to by friends JDQuackers 2/3/12 7:36 a.m.
Re: REACH MM Playlist Popularity Study Hoovaloov 2/2/12 5:02 p.m.
Re: REACH MM Playlist Popularity Study DEEP NNN 2/2/12 5:26 p.m.
Re: REACH MM Playlist Popularity Study squidnh3 2/2/12 5:38 p.m.
Re: Playlist Popularity Study - Thanks Wu DEEP NNN 2/5/12 1:25 p.m.
Re: Playlist Popularity Study - Thanks Wu Louis Wu 2/5/12 2:45 p.m.